As I look upon Cherilyn Sarkisian LaPiere, I see a woman who has led a spectacular life and behind her celebrity status and flawless complexion lies a woman who has experienced a rather eventful past. Better known as Cher, her success in music, movies, television, and on stage has brought her nearly four decades of world recognition. In a career defined as much by dramatic missteps as spectacular recoveries, the chief constant is her seemingly limitless determination. Born in El Centro, California in 1946, Cher was a poor, fatherless child whose eight times-married Mother struggled by on occasional singing gigs and brief movie roles. To Cher this was life and she delighted in watching her mother on stage and living a peaceful life in her family apartment. At sixteen Cher’s dyslexia proved too gruelling and she left school and home to take acting lessons in Los Angeles. To Cher this was a new beginning and the start of a whole new life, she didn’t expect what was to come. At the age of seventeen, Cher will never forget the time she met a man named Sonny. They met at the renowned Aldo’s Coffee Shop, the place where celebrities used to hang out. At that stage Cher was a nobody, unemployed and desperate for work, on the other hand Sonny had established himself as a celebrity and had many previous appearances on Television. Cher soon became attached to Sonny and she moved in with him. The two lived platonically at first, sharing an apartment but sleeping in twin beds. While Sonny progressed as a star, Cher was kept house bound and it wasn’t until Cher’s mother discovered the arrangement and tried to separate them, that the pair rebelled and proclaimed their love. Cher claims in her current Biography “The First Time”, that Sonny Bono was the ultimate love of her life and that the two remained amicable in personal st ruggles and hardships. Cher said, “What you saw on TV with Sonny and Cher was a good representation of our personal life, always laughing and having fun”. Sonny and Cher hit gold with their single, “I’ve got you babe” and furthered their world-wide success with “The Beat Goes On” and “Baby Don’ t Go”. It was Sonny and Cher’s far-out look, with wide colourful pants, skimpy tops, shaggy hair and fur vests, which attracted fans. Cher was deemed as a fashion innovator, a role she has continued with, for better or worse, throughout her career. The happy family portrait presented to America and the world was soon breaking down for Cher. She tells how her daughter Chastity, born in 1969 was affected by intense spotlight and that family life was becoming hectic and unstable . On stage Cher was calm, but backstage was turbulent and Cher felt trapped. Cher states in her biography, “The only way I could continue life happily was to split with Sonny and bring our show to a premature end.” She continues, “This devastated our fans, as well as CBS executives, but it had to be done, I was simply, unhappy with my life.” In the end stardom pulled Cher’s marriage down and the media attention on Cher sky rocketed as she dated new men. Cher now knows that she has made many mistakes in her life. “I was stupid” she said in her biography, “Dumb and stupid!”. Cher had agreed to a second season of Sonny and Cher. Sonny Bono rang Cher constantly to set up a reunion and Cher agreed eventually. Although something was different this time, Cher was married and pregnant to, southern rock great Greg Allman. Intense curiosity sparked huge initial ratings for the new Sonny and Cher Comedy hour, but Cher knew that the show wouldn’t last as ratings dropped every week. Finally in August 1977, after two seasons the show got the ax for good. Cher was still unhappy with her life, she felt tired of what she was doing and wanted more out of life. Her marriage to Allman was a mess as his addictions to booze and heroin ruined their short marriage. By 1979, their marriage was over and Cher was an unemployed 33-year old single mother, yearning for the impossible. A shot in serious films. Her damaged TV image and tabloid troubles were so ingrained, no one in Hollywood wanted her. Cher’s persistence is evident when she talks about her troubles, “You know, I had to go on, not only for my sake, but for my two children and the well-being of my career.” Cher was not over yet; in fact this would be the start of yet another career swap for the almighty star. She was casted in a movie called ‘Silkwood’ and acted opposite Meryl Streep. Cher tells, “I will never forget the time Silkwood premiered in New York and as soon as my name was mentioned, the audience just laughed. I felt so bad, but you know, you can’t argue with these things, it’s just a natural, organic response from the audience.” The people who down graded Cher would soon regret their viscous attacks, as Cher was soon faced with an Oscar for her performance in “Moonstruck” . By 1987 Cher was in such demand that she found herself in three films at once, “The witches of Eastwick”, “Suspect” and “Moonstruck”. She became a prime target for the paparazzi and her name was spread over every magazine and newspaper. At 41, after twenty-five years in show biz, Cher was at last on top and with a little help from the surgeon’s knife she remaines one of the most beautiful stars in Hollywood. Cher continued to raise eyebrows throughout her career. 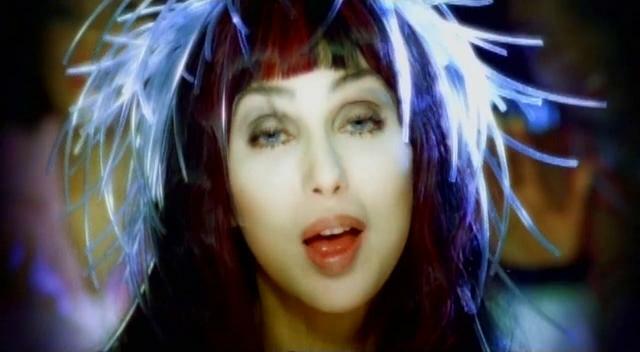 Who will ever forget Cher’s rip roaring video clip in the late 80’s? “If I could turn back time” was a huge hit for Cher, dressed in a risque outfit and prancing around on a ship full of young soldiers she made headlines once again. This was the start of a whole new decade for Cher. The nineties. With number one hits flowing from her vein’s Cher was a rock-pop genius. While Cher remained a star, her personal life remained stagnant. Her daughter Chastity announced that she was gay and began campaigning for gay rights. Cher tells “My response to Chastity being Gay was very un-Cher like. I didn’t know what to do and who to turn to, I was devastated! The funny thing is I knew all along that she was gay, I just didn’t want to admit it.” Cher’s current relationship with her daughter is extremely strong and Cher admits she has learned to except her daughter for who she is. The news of Sonny’s tragic death was one, which sparked much emotion in Cher’s life. “I was in London in January 1998 when I heard the dreaded news. Chastity rang me and brought the news of Sonny’s death. I dropped everything and fled to Heathrow Airport and the media watched my every move. Even though we had been apart for over 24 years I couldn’t ignore the fact that I spent a quarter of my life with this guy.” Cher tells of the day that she learnt of Sonny’s death as if it were only days ago in her biography. Full of remorse during her reconciliatory eulogy at his funeral, Cher praised the man who had been father, partner, friend, and foe , displaying a side of herself the world had never seen. Though hurt by endless criticism that her eulogy was an attention seeking devise to gain attention, Cher continued to mourn openly, paying tribute to Sonny Bono in a sentimental CBS documentary. It had been a period of over 5 years that the world had last heard Cher’s unique voice in an album. Just as she was written off by many in the criticising world of Hollywood, Cher hit back with a slick new disco album called Believe. This marked yet another upswing in her bumpy career. Although this time Cher had finally found gold. At the age of 53, looking more like a glamorous 20-year-old Cher’s new album is the best selling album of her 35-year recording career. By March 99 she was ruling the American Top 40 and holding the number one spot for a consecutive four weeks. She was now the oldest female ever to hit the top spot and owned the longest Billboard chart span between No. 1’s (65-99) of any pop recording artist. After the release of Cher’s next studio album “Living Proof”, Cher embarked on one of her most successful tours to date, The Farewell Tour. 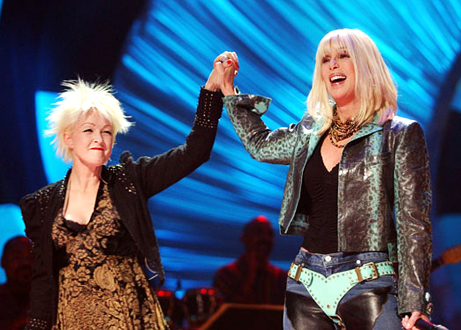 The show itself was a tribute to her near-40-years in show business. It featured vintage performance and video clips from the 1960s onwards, highlighting her successes in music, television, and film, all set amongst an elaborate backdrop and stage set-up, complete with backing band, singers and dancers, including aerial acrobatics. Dates were added, and the tour was extended several times, covering virtually all of the U.S. and Canada (plus 3 shows in Mexico City), several cities in Europe, as well as the major cities of Australia and New Zealand. Going well past its original cut-off date, it was eventually redubbed the “Never Can Say Goodbye Tour”. In April 2003 The Very Best of Cher, a CD collection of all of her greatest hits spanning her entire career, was released. The album peaked at number four on the Billboard 200 album chart, extending her album chart span to over 38 years. The compilation has been certified double platinum and has sold 3.5 million copies worldwide. On February 7, 2008, Cher, at 61, announced that she had reached a deal to perform 200 shows over three years live at the Colosseum at Caesars Palace Casino in Las Vegas pokies. 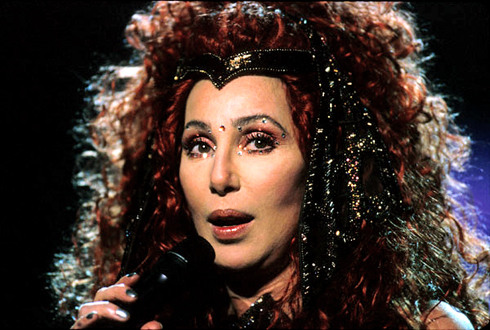 Her new show, titled Cher at the Colosseum, debuted on May 6, 2008. She is being paid $60 million for her return. The elaborate show includes eighteen dancers, four aerialists and multiple costumes designed by Bob Mackie. Choreography is directed by Doriana Sanchez who also worked with Cher on her past three major tours. Cher is currently working on a brand new studio album along with two major motion picture films, Burlesque alongside Christina Aguilera and The Drop Out. 2010 is geared to be a major year for Cher with these projects bound to bring her another wave of success and Cher has confirmed a 2014 world tour along with album release in Closer to the Truth September 2013.